Just when I think I’ve found my favorite bar in New York, I find another gem. I just finished reading “The Poisoner’s Handbook” by Deborah Blum which is about Jazz Age New York. It focuses on Prohibition and how it affected the city. I have spent the last couple of days fantasizing about the old speakeasies, the mysterious drinks that were shipped by bootleggers, the secrecy and dangerous nature of drinking. I love living in a city soaked in so much history. The theme of this bar predates the Jazz Age but still provoked in me a nostalgia for different times. Modern, trendy bars are a dime a dozen, and I prefer something spacious and cozy. 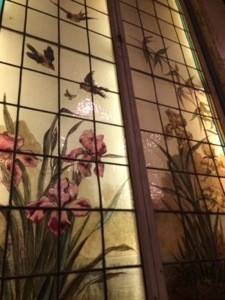 The large, weathered glass behind the bar, the velvet lampshades, the crystal chandeliers. 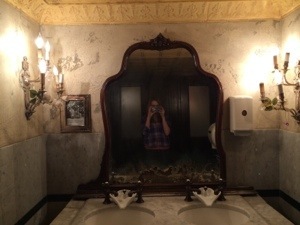 I was obsessed with these vintage mirrors that were everywhere. A friend and I ended up hanging out here for a good 4-5 hours in the afternoon, sipping on beer, sharing a spinach and artichoke dip. In my late twenties, I’ve found that I appreciate a bar that isn’t too crowded, is well lit, and doesn’t have music pumping so loud it causes my earrings to vibrate against my earlobes. This was perfect. I do have to mention that we were there in the late afternoon, and it did seem to get a bit more crowded as the after-work set began to show up. 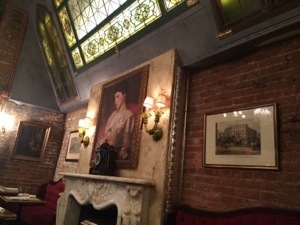 But, nonetheless, it’s a charming bar at which to while away the hours. When/if I ever come visit you, this is a place you absolutely must take me! I love those kinds of places too — way more awesome than a too-loud too-crowded club. You’d love it. I was thinking of you actually. My friend I went there with is considering massage school, and I was telling her how much you enjoyed it.